It is a solemn act of placing God at the center of people's lives, especially the family. 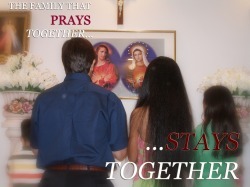 The members of the family accept holiness as a state to which God calls each one of them. Jesus is Lord and is worshipped as the King of the family. Mary, on the other hand, is the Mother of our Lord, our model for holiness and is honored as the Queen of the home. What happens after the house has been enthroned? A new way of life begins by fulfilling the C.A.R.E. program as the Family Daily Piety. Then, the enthroned family or individual will be registered by O.A.T.H. to the Vatican under the pontifical council to be member of the Alliance of the Holy Family International.